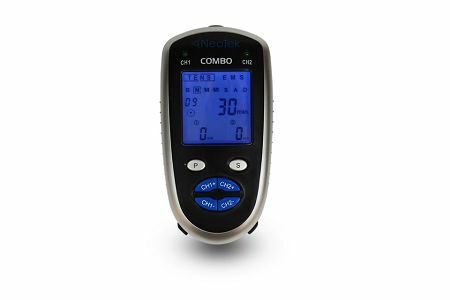 The NeoTek™ Digital TENS & EMS Combo is our #1 Pain Relief Device. This portable, easy-to-use device combines TENS (Transcutaneous Electrical Nerve Stimulation) with new and improved Neo-technology to address pain therapy in targeted body modes. 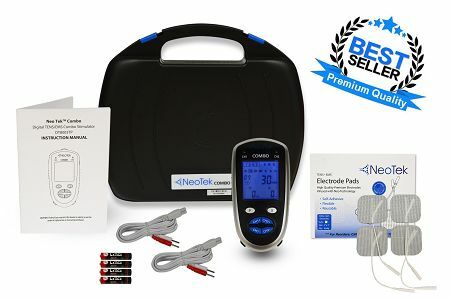 Relieve your pain by using the TENS mode in your NeoTek™ Digital Combo. TENS is a non-invasive, drug free method to control your pain by sending tiny electrical impulses through the skin. In many cases, this stimulation will greatly reduce or eliminate pain. Strengthen your muscles by using the EMS mode in your NeoTek™ Digital Combo. EMS is widely used in hospitals and sports clinics to treat muscle injuries, to re-educate paralyzed muscles, and to prevent atrophy in affected muscles. The NeoTek™ Digital Combo is a two output channel TENS & EMS combo machine that is highly effective in relieving pain and improving muscle functions.. TENS & EMS is now regularly recommended by doctors, physiotherapists and pharmacists throughout the world. Transcutaneous Electrical Nerve Stimulation (TENS) is a noninvasive, drug free method of controlling pain. TENS uses tiny electrical impulses sent through the skin to nerves to modify your pain perception. TENS does not cure any physiological problem; it only helps control the pain. Electrical Muscle Stimulation (EMS) is an internationally accepted and proven way of treating muscular injuries. It works by sending electronic pulses to the muscle needing treatment; this causes the muscle to exercise passively. This is being widely used in hospitals and sports clinics for the treatment of muscular injuries and for the re-education of paralyzed muscles, to prevent atrophy in a selected muscles and improving muscle tone and blood circulation. WORKS BETTER THAN EXPECTED. HAD ONE 25 YEARS AGO AND THIS ONE WORKS MUCH BETTER AND FOR HALF THE PRICE!!! This is my second TENS. I was a test subj. when the machine was originally introduced. Loved it then....love it now! I have both the totally portable version and this one. This has many advantages: For example, I can use it on my knee because of the size and flexibility of the pads. The pads seem to last forever as simply moistening them restores their adhesion. Several of my friends bought Tens as well based on my rec's....and love them as well. As soon as I feel a muscle ache or pain, I reach for my TENS instead of an NSAID. Work s well, easy to use, very satisfied. Awesome product. Both my wife and I have been having recurring back/neck pain. We go to the Chiropractor from time to time but experience pain in between visits. I have tried it and definitely alleviates pain. My wife was skeptical but after using the product one time the pain was gone even after 2 weeks. Although I will still need to go to the Chiropractor (less frequently) this is awesome for pain in between. Highly recommend. I've used TENS units for decades, starting with one prescribed by my doctor. TENS PRO has the best prices for TENS/EMS units, much better than Amazon or other online companies. Since I've used many different units, I can say that NeoTek is one of the best. It lasts a long time, has many helpful modes, gives sufficient strong stimulation for my very painful needs, and is a remarkable unit for a fair price. In fact, I had this TENS unit on when I kept my appointment at the Pain Management Clinic I go to for my severe pain. The woman who checked my BP, etc asked what brand I use. I highly recommended the NeoTek brand, and I told her to only order it from TENSPRO. I have been very satisfied over several years buying from TENS PRO-I get a great selection of units and electrode pads that arrive quickly. It's a great TENS unit from a great company and a great distributor! I love, love, love, my Tens unit it works like a charm for all my aches and pains. I have been very pleased on what this machine has offered. Was a gift. Arrived on time. I love this machine! I’ve owned Tens machines in the past. This is the first one I’ve gotten that treat nerve and muscle. Excellent machine, easy to use, great instructions. Using the Tens has helped a lot. After use, I feel like I have had a gentle and welcome massage on my shoulders. Many times I drift into a light sleep because I know it will automatically shut off at the end of the treatment. I would love it if it would completely erase my arthritis pain in my shoulders but that wld be asking a lot! I am grateful for the help it does give me. I am very happy with these products! I bought this ultrasound and the TENS & EMS for my parents because they are physical therapists. The products are very good, they use them a lot. On the other hand, the services are so efficient. They are worried that everything is fine for you. In my case, I needed this before my trip, so I was so worried about the delivery, but they did not hesitate to contact me and help me with this. I am very grateful for this. I recommend them completely! Q: Can this product use rechargeable batteries? Our NeoTek devices run only on AAA batteries, which we do also have available for sale separately, however, we do not carry the rechargeable variety, although they could certainly be used to power the unit if you would like. Q: Does this unit have rechargable batteries? The NeoTek devices only run off of AAA batteries. Although we do not carry any rechargeable AAA batteries, you should have no problem being able to find some at your local drug store. Q: What kind of battery does this machine need? Our NeoTek devices are powered by 4x AAA batteries. Each device comes with a pack of 4x batteries included, along with everything needed to start using it right away. Q: About 4 weeks ago I some how contracted Bells Palsy for the second time, the 1st time I was in the service and was given electric shock type therapy. Which system should be used TENS or EMS? Unfortunately, we can not make suggestions for specific therapies to use for individual medical cases, as we do not staff any doctors. For particular cases, we highly recommend first consulting with a doctor/medical professional to see what they recommend for you, and if an electrotherapy treatment such as TENS, EMS, Microcurrent, etc. is approved for you, then we will be more than happy to assist in recommending a device for your needs based on the orders of your doctor. Q: Are the little patches reusable? I have hip bursitis, osteoarthritis and tendinitis and am unable to take anti inflammatory meds. I am in constant pain. Would something like this tens unit help me? All of our electrodes, unless otherwise stated, come with the adhesive gel already on the pads and they are indeed reusable, including the electrodes included with the device. With proper care, the pads are good for about 10-15 uses per pack. For specific treatment cases, we highly recommend first consulting with a doctor/medical professional, and if an electrotherapy treatment such as TENS is suggested, then we will be happy to assist in recommending a device for you, or you can always place an order directly on our website at your own leisure. Q: What is included in the $69.95 ? Every device comes standard with everything needed to begin using it right away. For full product information, please refer to the Instruction Manual on the page and the Product Description, which also includes a full list of all items that come with each package. Q: Can a tens unit be used for TMJ? Please consult with a doctor/trained medical professional to find out whether an electrotherapy treatment, such as TENS, EMS, Microcurrent, etc., would be a viable solution for your particular set of needs.